Another leopard was caught on camera in Azerbaijan. The photographs of another leopard were captured on the territory of the Hirkan National Park, Trend reports citing the Ministry of Ecology and Natural Resources of Azerbaijan on January 11. During regular monitoring conducted by the IDEA Public Union and the World Wildlife Fund (WWF) in the framework of restoring the leopard population in the territory of the Hirkan National Park, photographs of the leopard were captured using camera traps. 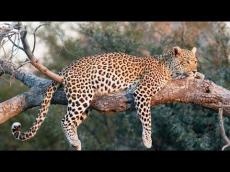 The photographs of leopards permanently shot on the territory of the Hirkan National Park prove once again that this species lives in the park constantly. Until the early 2000s, very little information was available about leopards living in the territory of Azerbaijan. But thanks to the studies of past 15 years, Azerbaijani zoologists discovered their traces in Hirkan forest, Nakhchivan and Mingachevir water reservoir. It should be noted that since the twentieth century, the leopard is listed in the Red Book. In Azerbaijan, these wild cats inhabit the territory of the Hirkan and Zangazur national parks. Several years ago, three young leopards were born on the territory of the Hirkan National Park. The Caucasian leopard is found across several countries, including Azerbaijan, Iran, Russia, Armenia, Turkmenistan, Afghanistan and Georgia. The Hirkan National Park, established in 2004 is located on the shores of the Caspian Sea in the southeast of Azerbaijan. The area of park was enlarged in 2008 and now occupies a total of 42,797 hectares . Its mission is to ensure the conservation of relict and endemic plant species of the Tertiary period, the protection of typical flora and fauna representatives of this area listed in the Red Data Book of the Republic of Azerbaijan, the implementation of environmental monitoring, public environmental education as well as creating conditions for research, tourism and recreation. The fauna existing in the territory of the Hirkan National Park is very rich in species. Here you can come accross Front-Asian leopard, brown bear, striped hyena, wolf, otter lynx, roe deer, wild boar, old world porcupine, jackal, badger, wild cat, fox etc. As many as 117 bird species can be encountered in the National Park area, and 68 of them have inhabited in the territory of the National Park. About 40 mammal species can be found in the National Park area. As for predators these are front-Asian leopard, bear, striped hyena, wolf, lynx, jackal, badger, wild cat, fox, otter, weasel, raccoon, beech marten. Front-Asian leopard, lynx, wild cat have been included to the Red Book of the Republic of Azerbaijan, striped hyena has been included both to the Red Book of the Republic of Azerbaijan and to the list of International Union for Conservation of Nature, while otter has been included to the list of International Union for Conservation of Nature and is preserved under law. Lesser horseshoe bat which inhabits the National Park area has been included into the list of International Union for Conservation of Nature and is protected by law.